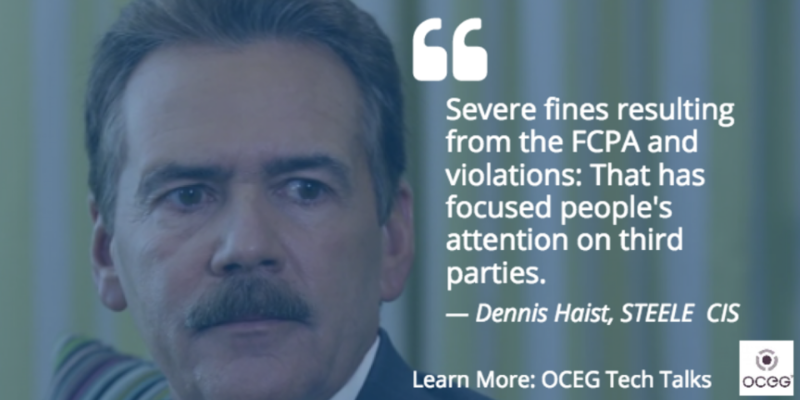 According to Dennis Haist, General Counsel at STEELE CIS, third party management challenges emerged with the Foreign Corrupt Practices Act (FCPA). A resource guide for the FCPA (written by the US Department Of Justice and US Securities and Exchange Commission) offered a solution: a risk based approach. But what is a risk based approach and which third parties does it apply to? Think of the external companies and individuals that support your business (both upstream and downstream): vendors, distributors, consultants, lawyers, accountants, independent sales representatives, agents, joint venture partners — the list of third parties can get very, long very quickly. As Dennis Haist explains, “A typical multi-national company may have 20 to 30 different categories of third parties.” And that’s just categories – actual third parties can run into the thousands. There’s also the challenge of out-of-date information. Company information systems (ERP and procurement for example) that track information about third parties often don’t talk to each other. This leads to incomplete and inaccurate information. “When looking at a risk based approach it’s a combination of utilizing risk factors, weighting those factors, and a consistent scoring of third party behavior,” explained Kenneth Kurtz. These risk factors are weighed and put into tiers (such as high, medium and low). Risk models are unique to each company and are affected by the risk tolerance and culture of the organization. A risk based third party management model allows you to conduct due diligence to evaluate if you should (and want to) do business with the third party. “The risk model is the central nervous system of your third party management program. That risk model doesn’t just dictate scope of due diligence, that risk model is often prescribing and impacting the terms and conditions within your agreements, due diligence, the type of training, and schedule for ongoing monitoring. That risk model is very, very important.” Kenneth Kurtz, Chief Strategy Officer. Below is a brief summary of how to create a risk based third party management model (there’s much greater detail in the Tech Talk video series). Think about how many third parties you have to manage. Consider the many steps in a third party management program. Ponder the numerous sources of information to be reviewed (in multiple countries). Now envision how an automated third party management program saves time and resources. Increased confidence that your third parties are honest, reliable, and compatible with your risk appetite. Stay informed and watch these 35 short videos. “Anti-Corruption and Technology,” is part of OCEG’s Tech Talk Series. The online videos explore GRC technology through interviews with solution experts. Visit the full series listing for more information.